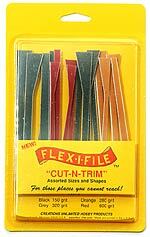 new Flex-i-File set with interesting new shapes. Same material as the famous Flexi-Pad. Two pices of two different sizes. Grit 150, 280, 320 and 600. All in all 16 files!